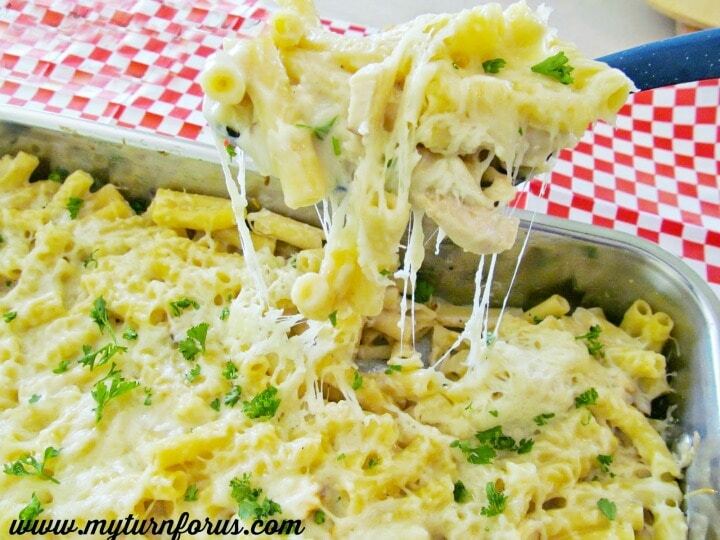 This easy Chicken Alfredo baked ziti is made from scratch and is one of our favorite recipes here at the Ranch. 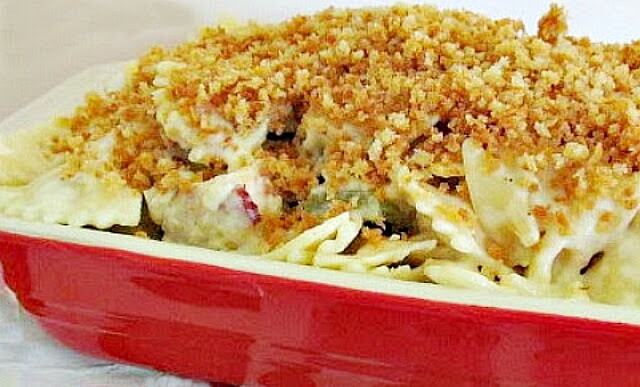 Baked pasta recipes are just the bomb. 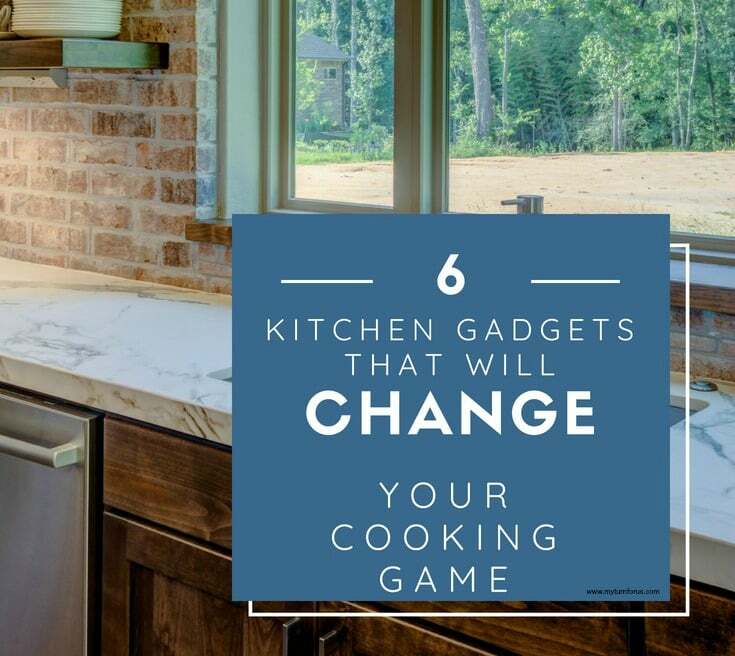 We love them because they make life so much easier because they can be assembled ahead of time. But of course they are delicious, we are pasta lovers, all things Italian go over well here at the Ranch. 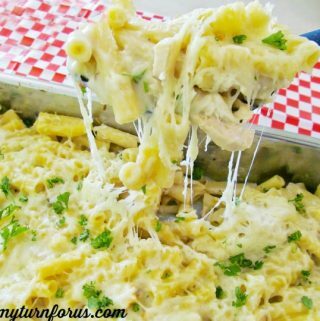 We usually assemble this Easy Chicken Alfredo early in the day and 25 minutes before we are ready to serve dinner, pop it into the oven. Sometimes we double it for a future freezer meal by assembling an additional one in a freezer pan. Then cover with heavy-duty aluminum foil, freeze and it’s good for 3 months. Sometimes we use rotisserie chicken in place of the grilled chicken and it makes this Chicken Alfredo recipe extra easy. And this is one of those recipes we have on hand to use when we fire up the grill and grill numerous chicken breasts at one time. Also, this recipe takes 12 cloves of chopped garlic which is sometimes a pain but we have two items that make the job so much easier. 1. Garlic peeler-it’s just a rubber tube that looks like a manicotti. The clove is placed into the tube and rolled and the peels are separated easily from the meat of the garlic. 2. 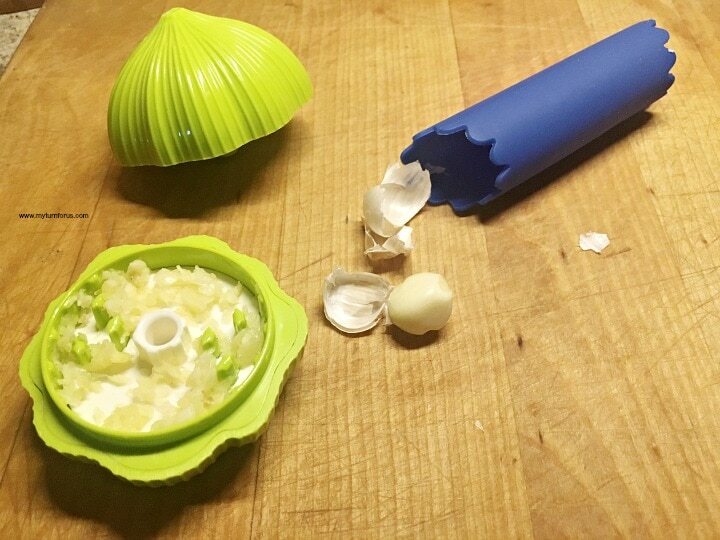 Garlic Chopper– it’s not your average garlic press. Twist to chop up to four peeled cloves of garlic at a time. This Alfredo sauce has an amazing flavor, and it’s well worth making it from scratch. It’s quick and easy, I pinkie promise. While making the Alfredo Sauce, cook the ziti according to package directions. Drain the pasta and return to stockpot and cover to keep warm. 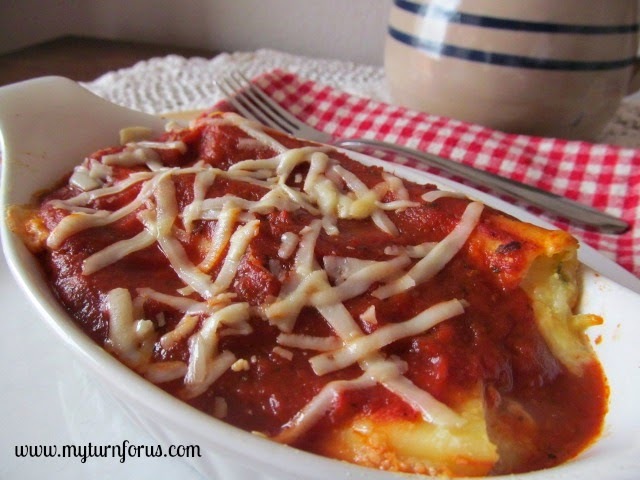 Sprinkle evenly with half of the mozzarella cheese, layer the remaining pasta mixture evenly on top and add the remaining cheese evenly over the top of the pasta. This sounds so yummy! I absolutely love Alfredo. Yes looks and sounds delicious! Thanks for sharing the recipe! I love each and every flavor in this dish. It's looks incredibly tasty. Oh my! I can't stand it! I would eat the whole pan if it was put in front of me! This looks so gooey and cheesy and yummy! Oh you are an evil woman! I am a sucker for creamy alfredo sauces. Yum! Pinned and will be trying this one for this kids, it looks great. Thanks for sharing! This looks like a winner. Glad I found it at #TurnItUpTuesday. Congrats on being featured! 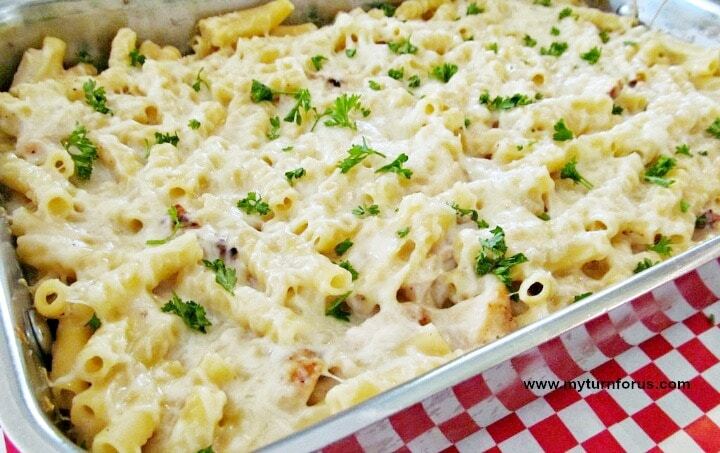 I can't wait to try your awesome Chicken Alfredo Baked Ziti! Thanks so much for sharing this awesome recipe with Full Plate Thursday and hope to see you real soon! I could totally go for some of this cheesy goodness! yum-o! This looks delicious. I would really love to eat some if this. Thanks so much for sharing with Adorned From Above's Link Party. I've had this pinned forever. Just finishing it up for supper tonight. Holy cow. If my stomach would have let me, I'd have eaten half the pan myself!